A few months ago, Kyle hosted a lunar quiz all about Arrested Development – it was a great hit, and laughter rang throughout the land. But those who discovered Triviology only after the event have gnashed their teeth and wailed their lamentations because they missed all the Bluthy fun. Therefore, by popular demand, Kyle will host yet another quiz, with fresh questions about the show, this Monday, September 28th, 7:00 at Ella Street Social Club. This is your last chance people – don’t miss I Just Blue Myself! Congratulations to Midas Touch My Balls, our inaugural champs at The Hutch on Holgate! This Wednesday, our regular trivia jockey for this weekly venue, Michele, will be making the quizzery for you. Remember that there is ample reward for your trivia prowess here – $50 gift certificate for the winning team, and $25 for the runners-up. Come mark your territory at the newest Triviology bar! $100 cash prize to the winning team of four! *Read about a past trivia bus I hosted to get a taste of the majesty. NERDY . . . YET INTIMIDATING! STILL, WHERE DID THE TRIVIA COME FROM?! *Congratulations to the innaugural champs!!! Thanks so much for making beautiful quizzery with me, everybody! We’ve been having such a great time at The Hutch (on Glisan), that the owners have asked me to double the fun by expanding the quizzery to The Hutch on Holgate as well! And since they can’t stand to go one more week without Triviology, the debut quiz will be held THIS Wednesday (Sep. 23) at 8:00! Though our beloved Margaret will be your host for the premier, I am thrilled to have scored Michele, who recently retired her That’s So Gay Trivia Night, as our regular trivia jockey at this venue – she is nothing if not hilarious (though she’s also smart, creative, and adventuresome . . . just so you know). Each week, the 1st place team will be awarded a $50 gift certificate to the bar, and 2nd place will receive $25. By the way, their sister venue, The Hutch, will begin splitting the mighty $100 prize on Wednesdays as well – $75 for the champs, and $25 for the runners-up. *Read about a past bus I hosted to get a taste of the majesty. Members of three different teams are pictured below . . . Triviology makes them enemies, but smoking makes them friends! 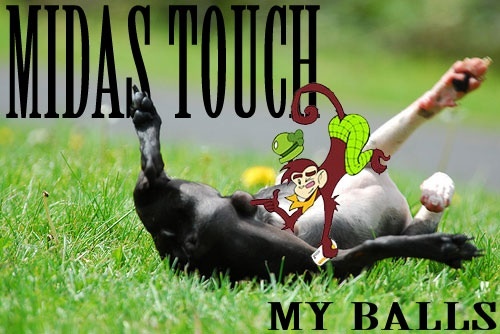 Note the “Keep On Touchin’” team T-shirt of Midas Touch My Balls. You are currently browsing the ShanRock's Triviology – Portland Oregon blog archives for September, 2009.